Arquitectonica tests the surf with ocean-influenced Regalia, a newly unveiled 488-foot-tall luxury condo in Sunny Isles, a city northeast of Miami. But the Florida skyscraper is leaving us with a distinct sense of déjà vu. 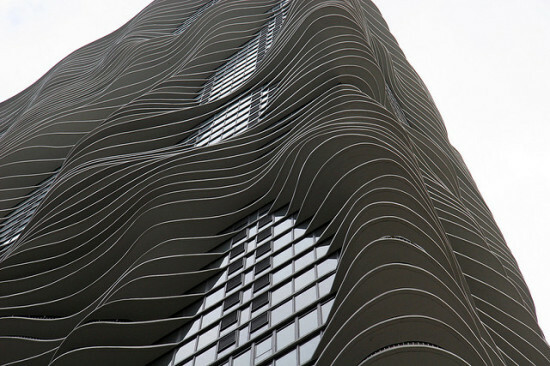 The tower looks strikingly similar to Studio Gang's Aqua in Chicago. While Gang's undulating concrete balconies extend as far as 12 feet to maximize views in the skyscraper-dense downtown, Arquitectonica's balconies in the same style afford uninterrupted views of the Atlantic on the building's sea-side. Gang's curving terraces were based on striated limestone outcroppings in the Great Lakes region, while Arquitectonica's are modeled on ocean waves. Although Chicago's lake-affected weather presumably hinders Aqua residents from enjoying their outdoor spaces year-round, Regalia's residents will have unfettered access to their sunny terraces all the time, if the barrier island the building is situated on doesn't flood or sink in the meantime. Regalia's 39 floor-through units and two penthouses are spread over 46 stories. "A rectangular glass prism houses the functional requirements," explained Bernardo Fort-Brescia, founding partner of Arquitectonica, in a statement to designboom. "Its transparent surfaces connect inside and outside, linking the occupants with the surrounding environment. Its orthogonal geometry creates elegant, serene, classical, zen-like spaces. Each floor is wrapped by a sensuously undulating terrace. The resulting walk-around veranda protects the glass surfaces from the sun, as in traditional Florida homes. It is this veranda that shapes the architecture." 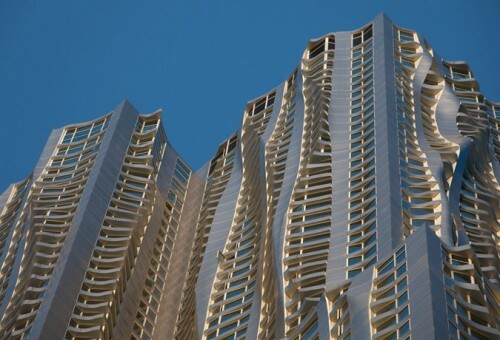 This is not the first curvy tower the Miami–based firm has designed for the Sunshine State. Last year, their 42-story residential tower, also inspired by (far choppier, it seems) ocean waves, opened on Miami's Biscayne Bay.